Jade Blakstone wanted some time away from his hectic schedule and took a trip to get away. He never expected to find a man who would strike all the right notes within him. Together they burn hot and fast, making Jade wonder if there is more between them than just a passing dalliance. But as hot as they burn for each other, so do the wild fires that have broken out. 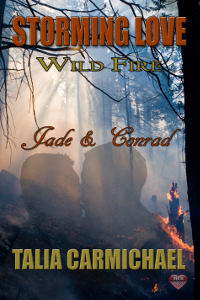 Conrad is a firefighter and Jade fears that they will be over before they begin when he goes to fight the fires raging in Northern California. From their very first meeting, Conrad Kendrick knew Jade was something special. Now he just had to convince Jade that although they have chemistry, there was something that was even sweeter-the connection of two souls who have found their corresponding rhythm.